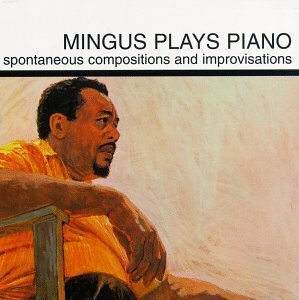 In 1954 Mingus cut some stuff for Period, since reissued several times, on which he played some exquisite piano solos. They should’ve led to more lengthy appearances on the instrument but didn’t until this 1963 disc. On Period Mingus had rhythm section backing and played gently unfolding, boppish single-note lines. Here he plays unaccompanied, performing standards and his originals, and using a more orchestral style. Like Art Tatum, whom he admired, Mingus does a lot of rubato work and emphasizes textural variation. Sometimes, in fact, playing like his has been called “arranger’s piano,” because he seems to be working out band arrangements on piano. Though he doesn’t have great piano technique, Mingus stays within his limitations; he doesn’t make a lot of mistakes. Most of the time his playing’s pensive and harmonically intriguing. While his main instrument was bass, many pianists would be happy to play as creatively as he does here.